When you divide one number by another, the result is called the quotient. This is true for rational expressions too! When you divide one rational expression by another, the result is called the quotient. This tutorial defines the quotient of a rational expression and shows you an example. Take a look! What's a Dividend in a Rational Expression? 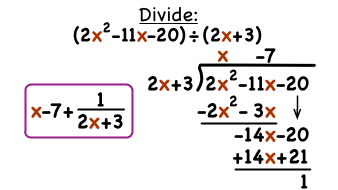 In division, the number that is being divided is called the dividend. The same thing is true if you're working with expressions instead of numbers! Learn more about dividends in this tutorial. A dividend is the number or expression that is being divided, but what is a partial dividend? Figure it out by watching this tutorial!